The Routeburn Track is a popular destination for travelers and avid hikers. Being one of New Zealand’s 10 Great Walks, Routeburn Track is well maintained and held to a higher standard than most other trails. 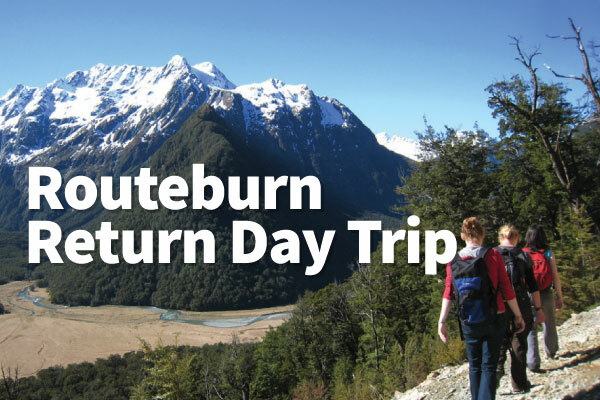 The Routeburn track is not only a multi-day track, but also an ideal day hike just a short distance from Queenstown. Travel up the scenic Glenorchy Road along Lake Wakatipu and in to Mount Aspiring National Park. You will be picked up at 8am in central Queenstown. Enjoy a short stop in Scenic Glenorchy before arriving at the Routeburn Shelter at approximately 9:45am. Our bus leaves the Routeburn Shelter to Queenstown at 2:pm, and in peak times again at 6:30pm, allowing you the flexibility to take the walk at your own pace. *Please note this is not a guided day walk, for guided options see here. Set in the stunning Mount Aspiring National Park, the track begins at the Routeburn Shelter and winds along the pristine Routeburn river. The track crosses the river several times with beautiful suspension bridges and offers stunning views of the snowcapped mountains. Walk through the native beech forest and admire New Zealand’s flora. The track is well formed, wide, and fairly even, suitable for most fitness levels. The first hut, at the Routeburn Flats is only 6.5 kilometres from the trailhead and between 1.5 and 2.5 hours one way. This is an ideal spot for a rest, or a picnic lunch, or perhaps to turn back for the day. From there the track begins to climb to the spectacular Bridal Falls and the Routeburn Falls Hut, another 2.3 kilometres further. From here you gain incredible views of the valley and look back on where you have come from.